Wow! I'm glad I went to the grocery store yesterday. I stole this picture from a friends facebook page. I think the ice storm of 2009 has a few people panicked about our current forecast! I wonder what people in Montana, Minnesota, etc think of stories like this? 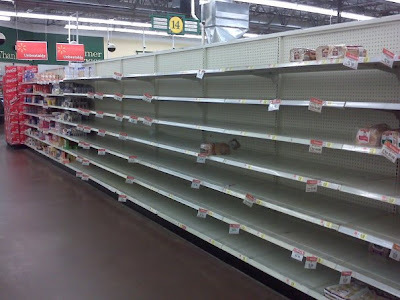 Do you think their store shelves look like this everything there's a chance of snow and ice? I hope if you're needing bread in NWA you know of a secret location to hit because I've heard this is the scene around the area. CRAZY! That is so funny! And no, if there is bad weather predicted here, I think I am the only one who runs to the grocery store(like the true Arkansan I am)!!! Love ya!